Every decision you make in your business is essential; whether it’s run-of-the-mill tasks or ensuring accurate documentation, all of this falls on you. There are many administrative tasks that can burden your productivity and deter you from growing your business. Don’t let costly mistakes and government regulations hold your business back. There are a sea of laws and regulations, and the water continues to get deeper and murkier. With new Affordable Care Act legislation happening, the amount you need to know as a business owner can mean endless paperwork and time-consuming admin work that leaves you no time to generate revenue for your business. The good news is there’s a better way. 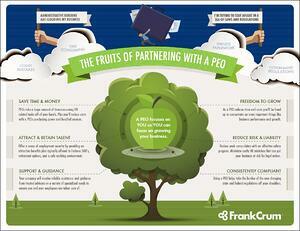 Partnering with a PEO (or professional employer organization) can mean fruitful gains for your business, and pressure off your back from potential costly mistakes. A PEO allows you to do what you do best: grow your business, and not focus on the burdensome administrative tasks that pull you away from getting back to work.